Three-year-old Secret Blaze showed he was on the path to the SA Derby with a strong win at Bendigo on Saturday, March 30. The Group 1 $500,000 TAB South Australian Derby (2500m) will be run at Morphettville on Saturday, May 11 and trainer Tony McEvoy believes the gelding is on the right track to prove a good chance. 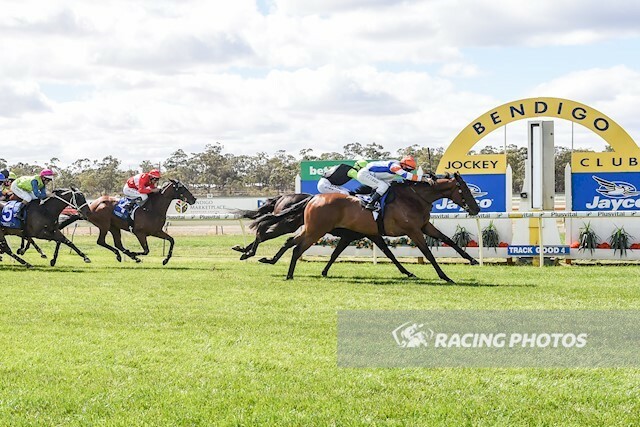 At Bendigo, Secret Blaze ($3.50 fav) overcame a wide draw with a top ride by Luke Currie, to score a neck win in The Big Screen Company Handicap (2200m) beating Budd Fox ($12) with Transact ($8), two lengths away third. McEvoy said while Secret Blaze was by the speed stallion Sizzling, the gelding had always indicated he wanted to stay. “We gave him the chance today, he carried 59kg and Luke gave him a beautiful trip,” McEvoy said. “I think we are on track to go to that South Australian Derby. “We may run in the final of that Galilee series in Melbourne in a few weeks over 2400 metres and that will top him off nicely. Winning jockey Luke Currie said he agreed with the trainer about Secret Blaze’s staying potential. “He got a bit keen stepping up in the shades last time,” Currie said. “We took them off and he settled a lot better today although when they slowed up down the back, he got a bit keen. “He was strong to the line today and he’ll improve off that. “He drew wide and I was hoping to slot in somewhere and we tucked in one off the fence and he got a bit of a rest.